“The results astounded us,” says Dr Peter Campbell, from the Cancer Genome Project at the Wellcome Trust Sanger Institute and senior author on the paper. 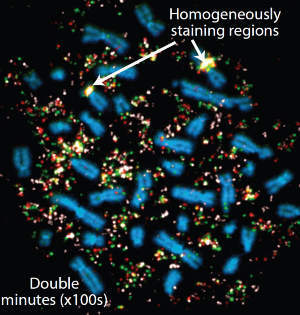 “It seems that in a single cell in a single event, one or more chromosomes basically explode – literally into hundreds of fragments. Cancer is typically viewed as a gradual evolution, taking years to accumulate the multiple mutations required to drive the cancer’s aggressive growth. Many cancers go through phases of abnormal tissue growth before eventually developing into malignant tumours. “We suspect catastrophes such as this might happen occasionally in the cells of our body,” says Dr Andy Futreal, Head of Cancer Genetics and Genomics at the Wellcome Trust Sanger Institute and an author on the paper. “The cells have to make a decision – to repair or to give up the ghost. “The evidence suggests that a single cellular crisis shatters a chromosome or chromosomes,” says Professor Mike Stratton, Director of the Wellcome Trust Sanger Institute and an author on the paper, “and that the DNA repair machinery pastes them back together in a highly erroneous order. This work was supported by the Wellcome Trust and the Chordoma Foundation.